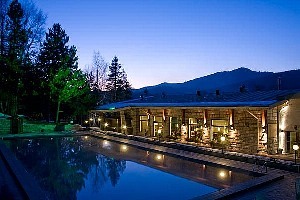 LOCATION: Balneo Complex & Spa Aquatonik is located in Velingrad, the spa capital of the Balkans. The complex stands on about 4, 5 decares and is built on the shore of the Kleptuza Lake, which is fed by the biggest Karst spring on the Balkans. 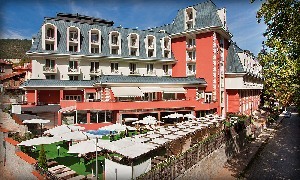 The Velingrad resort is located in the western part of the Chepino Valley near the conventional boundary between Rhodope mountains and Rila. The town lies on the bank of the Chepiska river and it is surrounded by rocks and mountains from all sides. 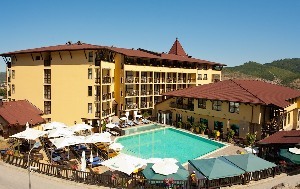 Velingrad is 85 km away from Plovdiv and 133 km from Sofia. 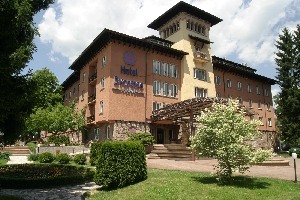 Velingrad is sited at a height of 745 m above the sea level. The climate is temperate continental. The atmospheric pressure is low (693 mm of mercury), the summer is cool and the winter is mild. The average year temperature is plus 9˚ С, the average temperature in January is minus 1,8 ˚ С, in July – plus 18,7 ˚ С. The autumn is warmer than the spring. The air is clean and transparent, there are no strong winds. The needle-leaved forests, the strong sun, the water richness, the clear mountain air and the healthful climate create conditions favourable for successful treatment in the health centres of Velingrad all year round. The Velingrad region is exceptionally rich in mineral water sources – there are 80 of them! Their aggregate water flow is 170 litres per second. The temperature of the water in them varies between 22 and 96˚ С. Velingrad occupies the first place in Bulgaria in the abundance and diversity of the mineral waters. The waters from three thermal zones (Lazhene, Kamenitsa and Chepino) are suitable for cure of different types of illnesses. The mineral waters are of light mineralization; they are hydrocarbonate sulphate waters containing sodium, potassium, calcium, silicon, fluorine and other trace elements. The waters from Chepino typically contain a small quantity of radon, fluorine and silicon. · endocrine diseases, metabolism disorders.